According to George Broussard (co-creator for the Duke Nukem series), LightBox Interactive has been affected with some major layoffs. Founded in January 2009, the fairly new developer currently has Starhawk as their only title. These layoffs haven’t been confirmed yet but this isn’t the first time that he has alerted people to layoffs within companies. He was the first to leak other layoffs such as WB Seattle, THQ and Popcap. With that being said, the chance of his tweet being false is extremely low. 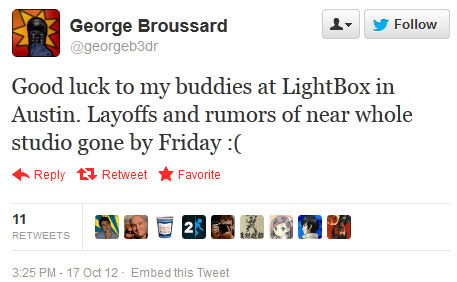 Now why are there probably layoffs happening at LightBox? Well, Starhawk came out this past May as an exclusive for the PS3 and while it did okay with critic reviews; the game didn’t sell too good. Once we hear more about this story as it progresses, we will update with more information. If the layoffs happen to be true, we here at GGN wish the best to those affected.